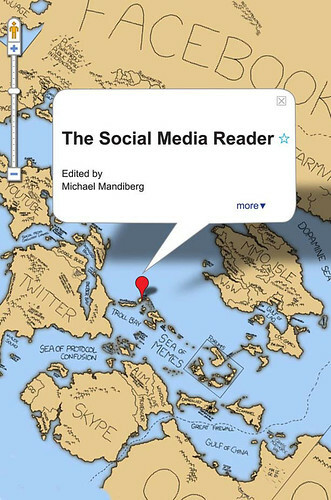 The Social Media Reader (NYU Press, 2012, ed. Michael Mandiberg) is a collection of essays exploring the rise of participatory culture, and the ensuing blurring of the boundaries between creators and audiences. The book features key essays from the major authors in the field, including Chris Anderson, Yochai Benkler, danah boyd, Henry Jenkins, Lawrence Lessig, Tim O'Reilly, Jay Rosen, Clay Shirky, and Siva Vaidhyanathan. With the rise of web 2.0 and social media platforms taking over vast tracts of territory on the internet, the media landscape has shifted drastically in the past 20 years, transforming previously stable relationships between media creators and consumers. The Social Media Reader is the first collection to address the collective transformation with pieces on social media, peer production, copyright politics, and other aspects of contemporary internet culture from all the major thinkers in the field. Culling a broad range and incorporating different styles of scholarship from foundational pieces and published articles to unpublished pieces, journalistic accounts, personal narratives from blogs, and whitepapers, covers a wide-ranging topical terrain, with particular emphasis on collaboration and sharing, the politics of social media and social networking, Free Culture and copyright politics, and labor and ownership. Theorizing new models of collaboration, identity, commerce, copyright, ownership, and labor, these essays outline possibilities for cultural democracy that arise when the formerly passive audience becomes active cultural creators, while warning of the dystopian potential of new forms of surveillance and control. Chris Anderson, C. W. Anderson, Fred Benenson, Yochai Benkler, danah boyd, E. Gabriella Coleman, Collaborative Futures collective (Adam Hyde, Mike Linksvayer, kanarinka, Michael Mandiberg, Marta Peirano, Sissu Tarka, Astra Taylor, Alan Toner, Mushon Zer-Aviv), Ashley Dawson, Patrick Davison, Lawrence Lessig, Fred von Lohmann, Henry Jenkins, Michael Mandiberg, Tim O'Reilly, Jay Rosen, Clay Shirky, Felix Stalder, and Siva Vaidhyanathan.